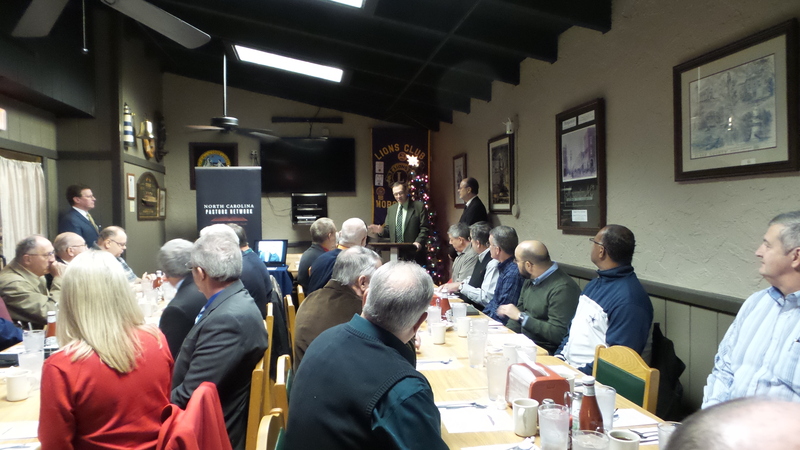 Yesterday, at a local Morganton, NC restaurant, the North Carolina Pastors Network (NCPN) held its fourth “Ministers Together” pastors/legislators breakfast. To put it directly, it was an absolutely phenomenal time. At 8:00 AM, pastors and elected officials began filling up our designated room at Abele’s Restaurant (necessitating use of an overflow area). The interaction between pastors and legislators was stirring to watch. Dr. Ken Carrico, Executive Director of NCPN opened the gathering with a heart felt welcome, followed by a stirring rendition of our National Anthem by my son Nathan and then an opening prayer by Pastor Bake Garman. 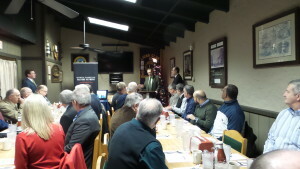 From there we enjoyed an incredible breakfast buffet provided by Abele’s owner, Wayne Abele. Special thanks are due to Wayne and his entire staff for an outstanding job serving us! Following breakfast, our formal program commenced. Dr. Carrico delivered a succinct but powerful statement regarding the purpose of NCPN, touching on some of the incredible opportunities of state and national impact in 2014. Following his comments, I was honored to share a brief message on Joseph’s powerful statement in Genesis 45, where he unequivocally declared that GOD had strategically placed him second in command in Egypt to (1) Preserve Life (2) Protect The Future, and to (3) Provide Advice. Its always thrilling to look into the eyes of listeners who are obviously “getting it.” Yesterday, it was clearly obvious that both pastors and elected officials “got it” as far as the content and application of the message. NCPN board member Pastor David Doster then led in a powerful time of testimony and prayer. The openness, honesty, and overt desire for God’s blessing on the part of elected officials was moving to say the least. As is our custom, pastors gathered around our elected officials, laid hands on their shoulders and prayed over them. The room was at times electric as petitions wafted heavenward from passionate pastors whose voices, and hearts, were filled with energetic prayer and praise. To conclude our incredible hour and a half together, I directly applied the message of the morning by asking for unequivocal commitment from both pastors and legislators. From the pastors I asked, “Will you commit to these two components? First, will you commit to pray regularly for the elected officials in this room? And second, will you pledge before a Holy God and those in this company to preach fearlessly on the moral issues affecting our nation?” Those who were willing to do so were asked to stand to their feet. Like an army moving in lock step, every pastor in the room, including those seated in the overflow area, stood quickly and resolutely! It was beyond stirring!!! Then, elected officials were asked, “Will you commit, before God and these pastors, to conduct your specific area of service (i.e. voting as a legislator, issuing rulings as a judge, conducting your job as mayor, county sheriff, etc.) in accordance with God’s word and Biblical principle?” “Will you be a modern day Joseph, believing that you are here for such a time as this?” Without ANY hesitation, every elected official in the room, whether a Superior Court Judge, District Attorney, Clerk of Court, Sheriff, County Commissioner, State Senator, State Congressman, stood directly in commitment to that purpose! Again, words can’t describe the atmosphere in the room!!! For far too long, we (pastors and church members) have abandoned the arena of civic government. Rather than doing that, we should have been engaging in the process, especially in active reaching out to, and discipleship of, those who serve in all areas of government. NCPN is committed to that task, knowing that both they (elected officials) and we (pastors/preachers) are “Ministers Together” for the glory of God, the sake of the gospel, and good of our communities! So, let’s get at this Biblical, highly redemptive, and, to be completely honest, beyond thrilling work!! !